Bucket List: What's the Origin of the Term? When Did People Start Saying “Bucket List”? 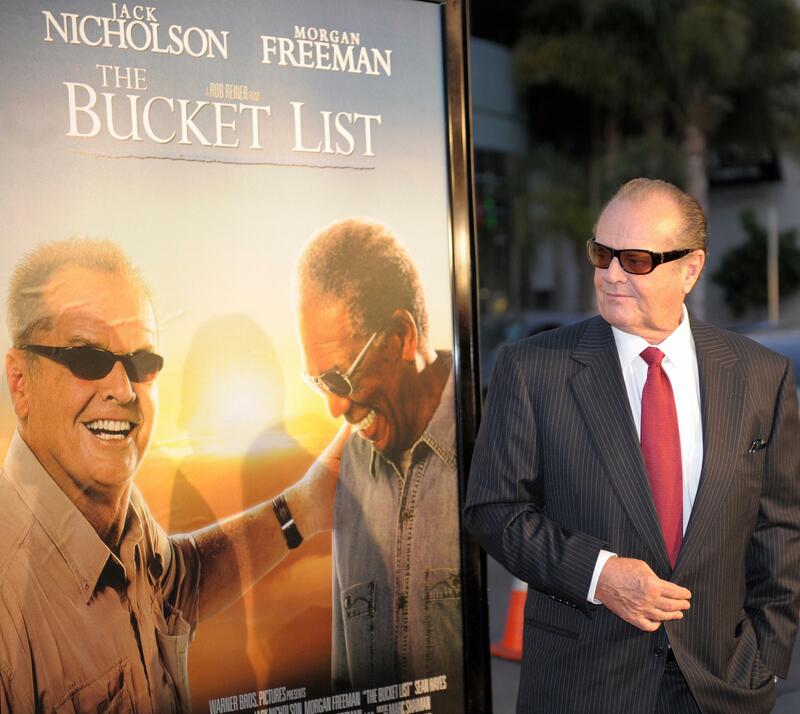 Jack Nicholson at ‘The Bucket List’ premiere, 2007. Update, May 29, 2015: Vocabulary.com executive editor Ben Zimmer considered the origins and evolution of the term bucket list in a May 29, 2015, Wall Street Journal column. According to Zimmer, (and word researcher Hugo van Kemenade), when used in this context, the phrase originated with Bucket List screenwriter Justin Zackham; the earlier usages mentioned in this column were misdated. I love a cultural coincidence. Two of the TV shows I watched last night mentioned bucket lists. On Glee, Kurt Hummel, all of 17, whipped out his iPhone and showed his boyfriend, Blaine, a few of the things he intends to do before he dies. (My favorite: “Arrive at school in a hot air balloon.”) On NCIS, Tony DiNozzo, shaken by a terrorist attack, became hyperaware of his own mortality and printed out a list that included more prosaic choices: “Date a Bond girl and/or Miss Universe. Develop a catch phrase. The luge.” When I tweeted about this, @magazinemama reminded me that on last week’s Parks & Recreation, doofus Andy was also working on a bucket list. His items included winning the lottery, making the best grilled-cheese sandwich ever, and remaking Kazaam (this time getting it right). I turned to the newly released fifth edition of the American Heritage Dictionary, but, sadly, it’s not included. Executive editor Steve Kleinedler told me that, although he’s been keeping an eye on the term, it needs a few more years in usage before it proves itself worthy of addition to the big book. Bonus cultural coincidence: Parkour has also cropped up in several TV shows of late—most recently Inspector Lewis (those wacky Oxford students! ), New Girl, Happy Endings, and Work of Art. (It was on The Office, which usually lags behind the cultural zeitgeist—Scranton!—back in 2010.) Parkour’s origins are more straightforward. According to the American Heritage Dictionary, it derives from the French term parcours de combattant—literally, “combatant’s course,” or more loosely, obstacle course. It is also related to the Medieval Latin percursus, the past participle of percurrere, meaning to run through or rove.